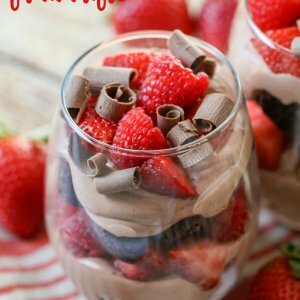 Brownies and Cream Fruit Trifle - a chocolatey dessert filled with brownie chunks, chocolate cream, strawberries and raspberries and chocolate curls! Make pudding by whisking together pudding mix and milk in a medium bowl. Mix well and then fold in Cool Whip until well combined. Refrigerate for at least half hour. Right before serving, layer cups with brownie pieces, some of the chocolate cream, fruit and then repeat layers. Top off with chocolate curls and ENJOY!